For dinner tonight we made panzanella (Italian bread salad) loosely following the Spring Panzanella recipe by Heidi Swanson on her 101 Cookbooks blog. 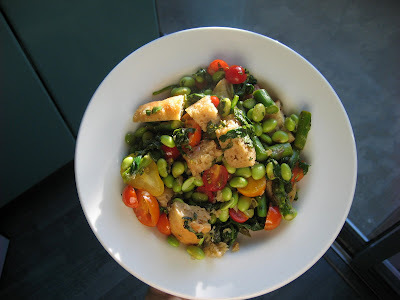 The version pictured above includes 2T of balsamic vinegar, 1c halved cherry tomatoes, and swaps shelled edamame for the peas in the original recipe -- it was fantastic. Panzanella is an extremely versatile salad made from chunks of day old bread toasted and tossed with ingredients of your choice and dressing. It is best when the ingredients produce the dressing themselves rather than adding something you create or buy. In this case, the cooking liquid from the vegetables, the juice from the tomatoes, and the balsamic vinegar made a great sauce that slightly softened the crunchy bread. I think of this meal every time we've got bread left over from the night before. Hearty breads, like the artisan loaves you find at most grocery stores, work best. Another recipe worth referencing is included in Marcella Hazan's Essentials of Classic Italian Cooking. Indeed! ;) We had a 1999 Chambolle-Musigny 1er Cru "Les Hauts-Dois" with this -- nice pairing.